Let the gypsies and Tarot reveal the mysteries of life. Click here to play! Have your palms read to unveil what lies ahead. If you can spin these reels just right a massive fortune may be in your immediate future. Be sure to look in to the crystal ball for a glimpse into your future. It will likely be a lot of cash if you can spin two to five of the spherical oracles across an active pay line as they will win you up to 5000 times your line bet. It also acts as a wild symbol and will substitute for all other symbols (excluding scatters and bonuses) to help you spin in more wins! Of course, you'll need the gypsy's help to read the ball. Spin two to five of her and you could get up to 500 times your line bet. Also helping you in your quest to reveal the secrets of your life are fortune cookies, magic eight balls, swamis, the oracle, Nostradamus, palm reading, and a few more. Don't forget the Tarot and Ouija Board in this mysterious game. These two symbols act as scatters. Spin three or more Ouija Boards and you will trigger five free spins. Spin three or more Tarot cards and you'll trigger a bonus round that will give you the chance to win even more cash prizes. 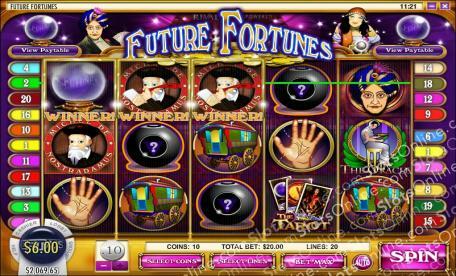 So, unlock the future of your life to see if a Future Fortune is in the cards! The Ouija Board acts as a scatter symbol. Spin three or more of these anywhere on the board and you will trigger five free spins in which the first wheel is filled with wild symbols, meaning that wins are guaranteed. The mysterious crystal ball acts as a wild symbol. Spin two or more of these on an active pay line and you will get up to 5000 times your line bet. They will also replace all other symbols to help you create more winning combinations. The Tarot cards will trigger a bonus game if you spin three or more anywhere on the board. During this round, the swamis will try to predict which card you will choose. If he guesses correctly, the game advances with more cards to choose from and higher prizes up for grabs. If he chooses incorrectly, the game ends and you are awarded your bonus prize.